New iOS: Should I upgrade? Author MattPosted on May 21, 2016 May 21, 2016 Tags 5s, 6, 7, 8, 8.4.1, 9, 9.2.1, 9.3.2, apple, comparison, iOS, iphone, performance, speed, upgrade, youtubeLeave a comment on New iOS: Should I upgrade? But why track your workout like this? Because working out is a long-term activity. Tracking your stats in a simple, easy way like this will help remind you where you’ve been, where you’ve gotten to, and provide a clear path of improvement so you’ll be on an upward workout trend and not plateaued or even going down (how would you know without tracking)? You’ll feel good about continuous improvement and more confident because you know where you’ve come from and where you’re going. I think most people would find tracking their workout tedious on paper or they just don’t know what workout app to use, etc. So I figured I show how it can be done with an app that most people have already. So, what you have above is a Gym tab in the Reminders app and I simply list all my exercises in the order that I do them. I also record any pertinent settings for the machine (like Level 12 and target heart rate 150 for the bicycle). 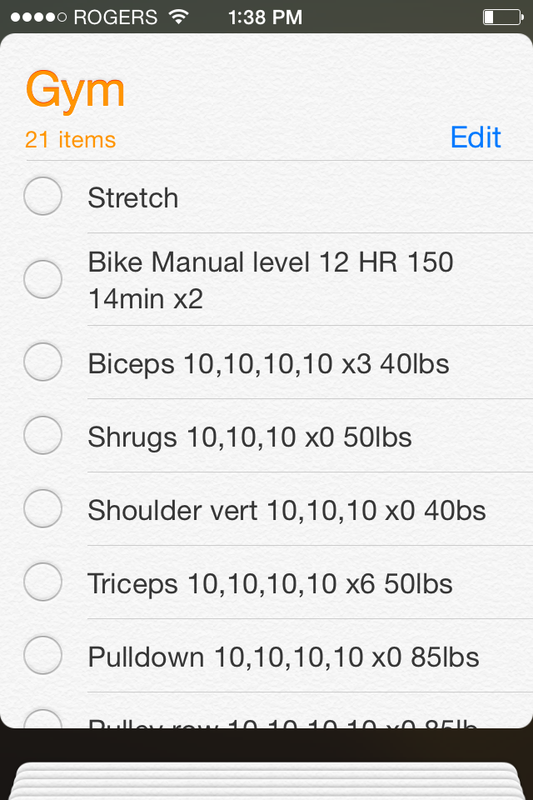 Then I record the sets and reps (“10,10,10,10” – ie. 4 sets of 10 reps each). I record the workout count (“x4”) meaning how many times I’ve done it (usually indicates once per workout). I also record the weight. 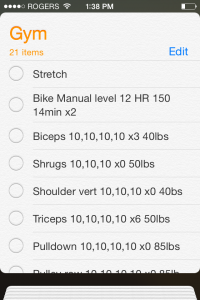 See how compact and easy it is to review your current workout when you record it like that? And it’s in the Reminders app that I use for everything else so it’s easy and convenient to use. For the record: I’m not a licensed gym trainer, physiotherapist or doctor. The ideas in this post are from my personal experience and I hope they can help some beginners as well. Following I’ve included some personal thoughts, recommendations and anecdotes about my experience at the gym since I’ve started. I hope it helps someone out there get started as well! Dealing with Rogers Sales Department? Dealing with Rogers Sales? Leverage. Maintain some form of leverage when dealing with Rogers. This is a brief history of my recent dealings with the Rogers Sales Department. Update 2012-06-09: A friend referred me to RedFlagDeals.com and their forum thread about getting the best deal with rogers. Check it out for info on what deals are available and how to go about getting them. Leverage. Maintain some form of leverage when dealing with Rogers. This is a brief history of my recent dealings with the Rogers Sales Department. Up until a week or so ago, I had been using a ghetto Motorola V551 flip-phone. In late May, my interest was piqued on the iPhone 3Gs. I called into Rogers Sales and agreed to go into contract for the iPhone 3GS 8GB at $99. I got evenings starting at 6pm for free, $12 Value Pack for free, and the 6GB data plan for $25 ($5 credit) all perks because I was going under contract. A week passed and my phone had not arrived. I phoned back in and apparently they were out of stock. So I had them cancel my plan they happily put me on without having a phone to back it up. In late August, after hearing interesting things about Android phones from my brother in law, my interest was again piqued. So I phoned into Rogers sales department again and came to the same agreement about perks. I picked up the $29.99 value (for going under contract) Acer Liquid E. Great phone, in and of itself, by the way. I recommend it. Now, the thing with carriers is that contracts are leverage one way or another. You can get good deals if you’re not under contract. If you are on contract, you’re not going to get deals. If you have other non-contract services, however, like internet, cable or home phone, well now you have some other leverage to work with. Remember this when dealing with the sales department. So, late August I phone in and come to an agreement with a deal that satisfies me. You know how sometimes you buy something or enter a contract and it gives you a bad feeling? Well I had a good feeling about this. I got what I wanted at a price I was willing to pay. Evenings from 6pm, 6GB data plan $5 off, $12 value pack. So, I eventually get my phone and really enjoy it. I like the perks I have. I keep an eye on the My Rogers service, too, which tells you about your plan and your usage. I noticed a few things were off. Well, today, I phone in and find out that I do not have the $12 value pack thrown in for free, I do not have 15% discount for having three services (I also find out the actual 10% discount for 3 services only applies to your voice plan amount. Aggravating! ), and the first person I talk to does not understand the 6GB data plan $5 credit. So I tell the billing department person I need action on this because the contract agreement has changed. Fortunately, although I asked for Sales, she redirected me to Retention. The Retention department is where you want to be when you need to talk serious with Rogers. But, remember, you must have leverage. My leverage came in the knowledge that I know what I agreed to the first time, I verbally confirmed it repeatedly, I told this to the Retention person, I have two other non-contract services in case I need to use them as leverage, and I have a long history with Rogers – I’ve had a phone with them since 1998. Clearly, I’m probably not out to screw them over. In Retention, I’m told I actually do have evenings from 6pm. Good. The 6GB data plan $5 credit wasn’t done but is doable. Fine. The $12 Value Pack is impossible, has never been an offer (*cough* *splutter* *vein pop*). Dear me. I was silent on the phone for a minute. I was seriously thinking of bringing out the other two non-contract services as leverage. Instead, I asked could he apply a credit to any other charge on my account to bring my total cost to the same price that I agreed to when I initially went under contract. Silence. “Oh yeah, here’s what I can do! …” Turns out Rogers has some non-dollar amount Value Pack equivalent that gives you more than the $12 Value Pack and they can credit it right back to your account, making it free. So, here’s the deal, when Rogers says they’re giving you something for free on the phone, they’re not, and people you talk to at Rogers won’t acknowledge the “terms” that you’re using. What they do understand is “credit”. What they can do is charge you the original price and credit you back on your bill – accomplishing the same goal. They just play dumb for reasons unknown to me. Here’s the thing. I agreed to a contract with specific terms. Rogers changed those terms on me without notice. What is up with this practice? Isn’t this illegal? Shouldn’t it be? The kicker is they had no solid details on my account about my previous phone call in which I agreed to go under contract. How is that possible! Leverage. Make sure you have it. Either be free of contract when talking to their sales department or have other non-contract services to bargain with if things are really bad. A long history of good customer relationship is a bonus, too. Evenings from 6pm. This is an add-on you can pay for. You can get it for free going under contract. Remember, ask for an “offset credit”, not “throw it in for free”, which is how I worded it and they wouldn’t acknowledge that. 6GB data plan for the price of the 500MB data. A $5 credit (remember, “offset credit”). You may be able to work a better deal than $5. The price for that kind of data is very high to begin with. (Rogers Internal) Value Pack. This is the not the public value packs you can see on their website. If you go under contract, ask about whatever value pack they can give you that is the equivalent or better of the $12 Value Pack and ask for an offset credit. What other perks do you know about? Would love to know. Remember, Canadians pay some of the highest phone rates in the world. You are getting taken for a ride. The only thing you can do is try to get the best deal possible in a bad situation. So, don’t worry about asking for these perks. If they’re going to lock you in to a multi-year contract, they owe you and they should be happy to retain your business. When all was said and done, I ended up with a 3 year contract $10 higher than the one I actually agreed to the first time. I’m still a little ticked off at that but at least it’s only $10 higher. This is all not to mention that my account, summing all service prices, is in the hundreds of dollars a month. Shame on you Rogers for treating your customers like this. Author MattPosted on September 11, 2010 August 29, 2012 Tags 3gs, acer, apple, bell, billing, buy, cell, contract, credit, customer, data, department, e, iphone, liquid, motorola, offset, phone, plan, purchase, relationship, retention, rogers, sales, service, terms, update, v551, voice4 Comments on Dealing with Rogers Sales Department?